When trying to figure out how to determine bandsaw blade size, it is important to know the job that will be performed using that particular saw blade. Things like material, amount, and cut. Most bandsaws will accept a range of blade lengths, sometimes with as much as 2” difference between the shortest and longest blades that the bandsaw will allow. If there is no blade to measure, or there is need of a new blade that may or may not properly fit the bandsaw machine, then it becomes necessary to determine the range of lengths the machine can be expected to mount. This sum is the saw’s shortest blade length. The same steps will also determine longest blade length. If the owner’s manual is still available, it will indicate an average length for both. In practice, the bandsaw is capable of using saw blades a little larger than the shortest length to perhaps 3/8” or 1/2” less than the longest length. If you have an old saw blade that fits the bandsaw in use, then it becomes much easier to measure length. The exact measurement is just a target, by the way. 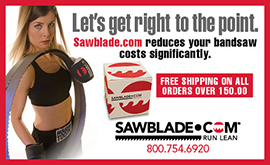 If the saw blade measures 114-5/8”, there is no need to special-order that exact length. Try a 114” or 115” length saw blade. It is likely that either will work just fine. These procedures are the best way to determine the right size bandsaw blade for a particular bandsaw machine. This entry was posted in All Posts and tagged #bandsaws, alloys, angles, bandsaw machine, formulas, machining, metals, metalworking, saw blade sizes, saw blades, saw teeth, sawblade.com, woodworking. Bookmark the permalink.